“Leonic wires” are silver-plated, gold-plated or zinc-plated copper wires and threads. Introduced by the Huguenot immigrants from Lyon, hence the name “Leonic”, these wires and goods produced using them have been made in Roth near Nuremberg and in the Nuremberg region since 1590. Annaberg in Saxony is an important centre of the Leonic wire industry though too. Leonic wires were produced in different webs, crimped, spirally wound, curled and flat. It was usually used to decorate Christmas decorations by wrapping the fine wires like a web around the objects. Combined with a whole range of different materials really unique objects were developed too, which partly followed specific fashion trends in their motifs. 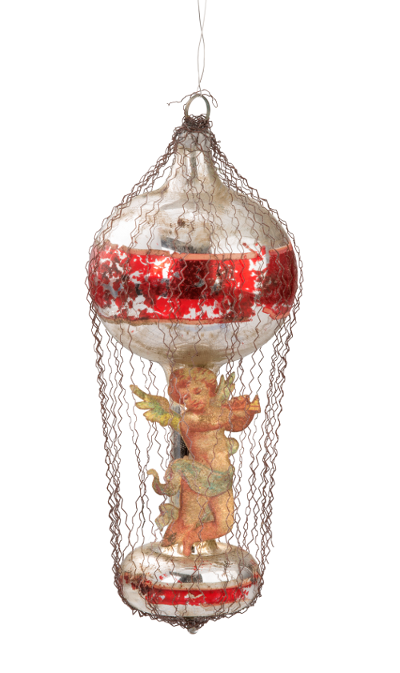 This is how the balloon decorations came about in the 1890s: A structure usually consisting of two different sized glass baubles connected together by a glass rod, which was usually turned into hot air balloons with gondolas, ships and boats using leonic wire webs. During the Christmas period other beaten metal products were used, such as brass in its flat pressed shape, called “Rauschgold”. It was mainly used to produce tinsel angels as well as to replace gold leaf for festive decorations, e.g. nuts. This kind of tinsel is not produced any more today. Lametta (the diminutive form of the Italian lama “metal leaf”) is also made of narrow, thin, shiny metal strips. Foil was traditionally used as the basic material, which used to be made out of a silver lead alloy but was later made out of tin. It was smelted, cast, rolled and cut into very narrow strips. Tin foil lametta may contain a percentage of lead as the core to make the lametta heavier and therefore improve how it falls. Today lametta is usually made out of aluminium or metallised plastic.